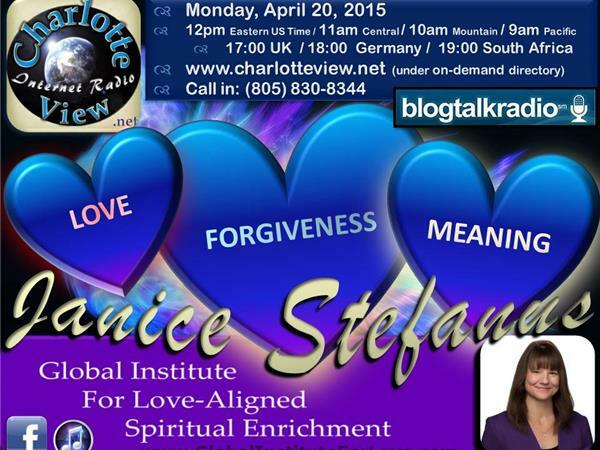 Charlotte View welcomes Divine Healer & Spiritual Advisor, Janice Stefanus. She is the Founder of Global Institute For Love-Aligned Spiritual Enrichment. Their Mission is to help spiritually aware people: awake to the love they are, remember who they are, understand why they're here, embrace their life’s greater mission, and break through obstacles holding them back so they can move forward to create the life they know is truly possible. After a life-altering event caused Janice’s life as she knew it to collapse beneath her, she realized the career she invested her life developing now felt meaningless and began searching for deeper meaning, forgiveness and love. Join Janice to learn how to understand why events happen to wake us up, make sense of the chaos in your life and find the “more” your heart longs for. In this show, Janice will share some lessons and strategies she learned and developed during her transformation quest. Plus her most significant lesson that With Love, Darkness Fades.